Kentucky and South Carolina remained on top of the SEC standings after sweeps Friday night, while Georgia and Tennessee each registered their second win of the league season. The Vols boasted the offensive edge in the match, outhitting the Tigers .256 to .199 and putting down seven more kills (70-63) en route to the win. Tennessee hit .240 or better in the three sets it won, including a match-best .438 clip in Set 5, while Missouri struggled to just a .048 effort in the final stanza. Erica Treiber was the star of the night, turning in 19 kills and hitting at a .600 clip (19-1-30) for the Vols. Lily Felts added a 15-kill, 13-dig double-double, while Tessa Grubbs notched 11 putaways. Addisyn Rowe chimed in with eight kills and a team-best six blocks. Sedona Hansen dished out 30 assists and added 13 digs to finish off a double-double. Four Missouri players posted double-digit kill tallies, but it was not enough. Kylie Deberg (15), Dariana Hollingsworth (14), Leketor Member-Meneh (14) and Tyanna Omazic (10) made up the group. Hollingsworth hit at a team-hit .407 clip and added 10 kills and three blocks. Deberg chipped in four stuffs and two aces. Alyssa Munlyn added seven putaways and a team-best seven blocks. After swapping sets over the first four stanzas, Tennessee wasted no time staking its claim on Set 5, jumping ahead 9-4 with help from two kills and a block by Treiber. The Tigers would get no closer than three the rest of the way and the Vols capped the match on a 3-0 run, including back-to-back Mizzou miscues. The Wildcats started the match with a statement offensive effort, hitting .593 with just two errors, and maintained the offensive advantage throughout the match, registering their second SEC victory. Kentucky fell off a bit offensively, hitting .340 for the match after two efforts near .250, but still outdid the Razorbacks’ .172 mark. The Wildcats also led in kills (48-35) and aces (5-2). Brooke Morgan notched a career-high 15 kills on a .583 hitting effort, while Leah Edmond also turned in 15 putaways at a .310 clip to lead the UK offense. Caitlyn Cooper added in nine kills, while hitting .500. Kelly O’Brien was tops among the Razorbacks with 10 kills on a .444 hitting performance. Elizabeth Pamphile, Hailey Dirrigl and Fernanda Guitron managed seven kills apiece. Guitron led the team at the net with five blocks. After using an 8-2 push in a come-from-behind win in Set 2, the Wildcats put together a 5-0 run in Set 3 to go up 12-8 and take a lead which they would not relinquish. Lauren Tharp served up two aces in the rally. The Razorbacks cut the margin to two at 16-14, but another 4-0 run, buoyed by two Morgan putaways made it 20-14. Kentucky would go on to score four of the final five points to seal the win, with Morgan notching a block and a kill to set up a final Arkansas hitting miscue. 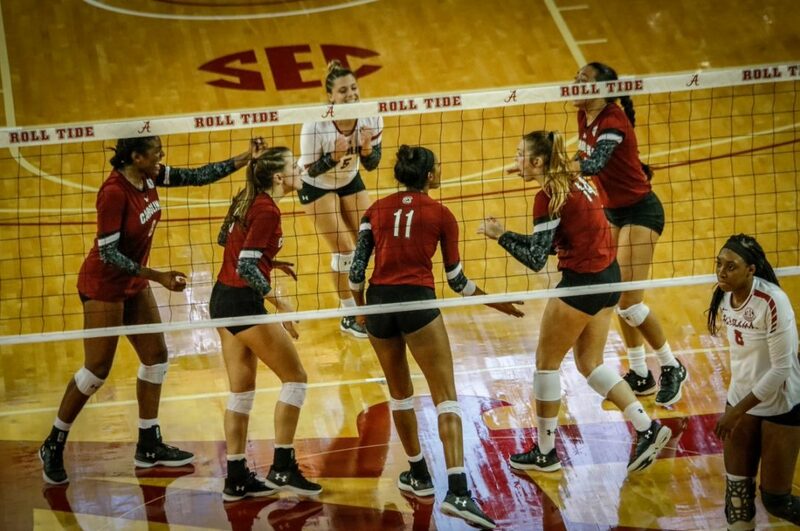 The Gamecocks extended their win streak to eight matches, beat Alabama in Tuscaloosa for the first time since 2012 and notched their first 3-0 SEC start since 2003 with a Friday sweep. Neither team hit particularly well, but South Carolina was the better of the two, using two .200+ efforts to managed a .181 clip on the night. Alabama started with a .216 effort, but dropped significantly as the night went on, hitting -.051 in Set 3. The Gamecocks boasted a 48-32 lead in kills, but the Crimson Tide held the advantage on the block (12-7). Brittany McLean was tops offensively for South Carolina with 14 kills, while Jess Vastine (10), Mikayla Shields (10) and Mikayla Robinson (9) followed. Robinson hit at a team-leading .250 clip and put up six blocks. Vastine rounded out a double-double with 12 digs. Doris Carter was one of four Tide players with six or more putaways, notching eight. Hayley McSparin added seven kills on a team-leading .333 clip. Mahalia Swink and Ginger Perinar posted six apiece. Cidavia Hall managed just three kills, but led the team with eight blocks. After two extra-point sets, the Gamecocks cruised to a 9-0 advantage in Set 3, including three blocks and a kill by Robinson. Alabama pulled within five at 12-7, but committed three errors to give South Carolina a nine-point edge at 17-8. The Crimson Tide wasn’t done yet, however, scoring 11 of the next 15 points to slice the margin to two at 21-19. Seven Gamecock errors aided the run. After taking a timeout, South Carolina recovered and scored four straight points, all on kills, three by McLean, to end the match. Georgia edged Ole Miss in kills (54-40) and boasted a slightly higher hitting percentage (.297 to .295) in its first SEC road win of the season. The Bulldogs led 4-0 in aces, but the Rebels countered with a 10-6 advantage in blocks. A balance offensive attack led the Bulldogs to victory with four players notching nine or more putaways. Rachel Ritchie (16), T’ara Ceasar (11), Mallory Hernandez (10) and Majesti Bass (9) made up the group. Hernandez hit .421 for the match, while Ritchie boasted a .400 effort to go with her team-leading three aces. Emily Stroup led all hitters with 19 putaways for Ole Miss, while hitting at a .400 clip and adding six digs and two blocks. Leah Mulkey was next on the team with seven kills on a .000 hitting percentage and three blocks. Nayo Warnell led the Rebel block with four stuffs. After splitting the first 16 points of Set 3, Ole Miss gained a 12-9 edge with two kills and a block by Stroup. Georgia countered with a 6-2 run, and three Ceasar kills, to go up 15-14. After four more ties, last at 18, the Bulldogs crept away by three at 21-18. The Rebels tied it up at 21 and 22 and earned three set-point tries, last at 26-25. Hernandez took over for the Bulldogs with two kills and a block to clinch the sweep.